2. 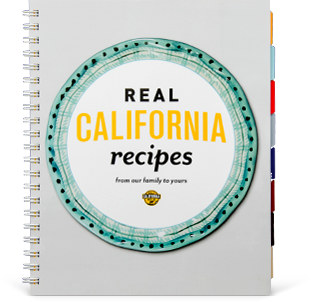 Place butter in a 12-inch shallow, ovenproof skillet and melt in oven. Watch carefully to avoid burning. 3. Meanwhile, in a blender, whirl together milk, eggs, flour, granulated sugar and salt until smooth. 4. Remove skillet from oven and swirl butter to coat sides of pan; pour in milk mixture. 5. Return to oven; bake until puffed and golden brown, about 25 to 30 minutes. 6. 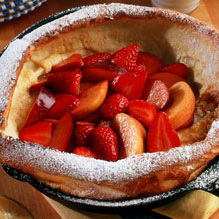 While Dutch Baby is baking, combine fruit and sweeten with powdered sugar as desired. When baked, remove pancake from oven and dust with powdered sugar. 7. Spoon fruit onto center of pancake. Cut into wedges and serve immediately with lemon wedges.